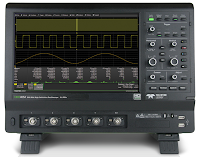 At first glance, the front of today's oscilloscopes can be daunting. For starters, there's an array of physical "hard" controls. Relatively recent models may also sport touch screen displays with so-called "soft" controls. For one thing, getting familiar with the front of these instruments is only a matter of experimentation and common sense. And for another, what at first may seem complex is carefully designed to make the instrument as easy to operate as possible. This is the first installment of a projected series of posts that will explain how to control a modern oscilloscope. Here, we'll start with the front panel. Let's take a look at the business end of a representative mid-range oscilloscope, Teledyne LeCroy's HDO Series (Figure 1). At the highest level, the touch screen display is to the upper left; the front panel to the upper right; and the power switch, channel inputs, a calibration signal output/ground, and two USB ports across the bottom. So let's zoom in on the front panel itself (Figure 2). It's important to note that many of the front-panel functions are duplicated by the touch-screen display. Many users find it easier to manipulate the instrument through the touch screen, while others prefer the "hard" front panel controls. We'll dig into the touch-screen topic at another time. Across the top of the front panel are several shortcut controls. Auto Setup is not unlike a digital SLR camera's totally automatic mode, in which the camera makes its best guess at setting itself up for a shot. If a user is really unsure how to get a stable display of a channel input, Auto Setup will get you in the ballpark. Default Setup places the instrument's display into a basic arrangement with grids for two channels. The Print button captures the screen and lets you choose between printing, saving to a file, or creating a LabNotebook entry. The Touch Screen button simply activates or disables touch-screen functionality, while the Clear Sweeps button resets accumulated data from a series of acquisitions. Another group of shortcut controls is found in a horizontal row at the bottom of the front panel. 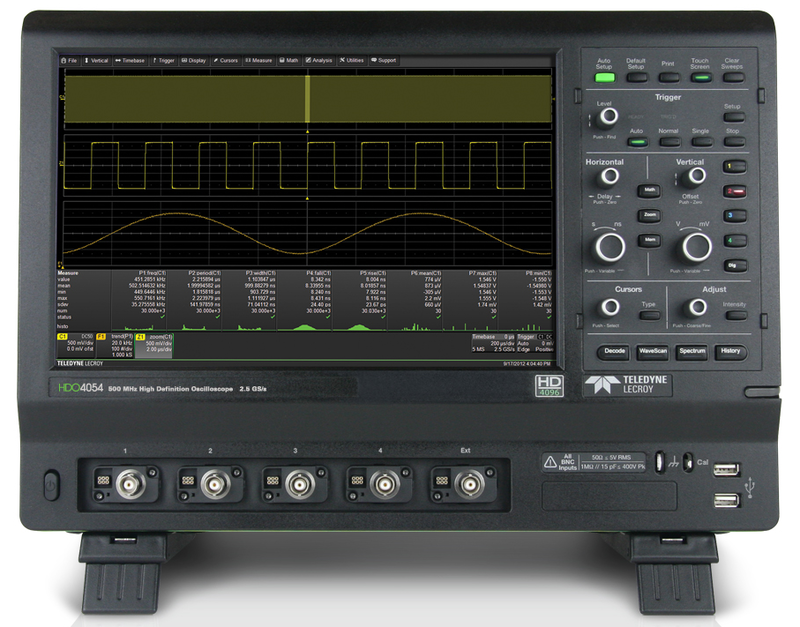 These are quick entrees into some specialized functions of the HDO oscilloscopes, including serial decode, WaveScan for advanced waveform search and analysis, Spectrum Analyzer for fast-Fourier transform functions, and History mode for playback and analysis of a series of acquisitions. Now for the meat of the matter: the Trigger section and Horizontal and Vertical sections. The basics of triggering are covered in an earlier post, so suffice to say that the Trigger section enables you to quickly find the appropriate triggering level for a given channel, to select a triggering mode (or stop triggering), and open the Trigger Setup dialog. At the heart of the front panel are the Horizontal and Vertical controls. The Vertical controls adjust the channel trace along the Y axis, i.e., they determine how the trace is displayed in terms of volts/division. There's the ability to establish an offset as well. The volts/division control may also be pushed to gain finer (variable) control. To the right of the Vertical controls are pushbuttons to activate/deactivate each of the instrument's four input channels. The Horizontal controls adjust the trace along the X axis. The Delay knob sets triggering delay; pushing the knob zeroes the delay out. The Timebase knob raises or lowers time/division on the X axis. A column of buttons straddling the Horizontal and Vertical sections are shortcuts to math functions, zoom traces, and access to traces stored in the oscilloscope's internal memory. Below the Horizontal controls are the Cursors controls used to set measurement points on a trace. The knob adjusts cursor position, while the Type button cycles through Horizontal (Time), Horizontal + Vertical, Vertical (Amplitude), Horizontal (Frequency), and Horizontal (Event) cursor types. A sixth press of the Type button will turn Cursors off. Lastly, the Adjust knob changes the value in any highlighted entry field on the display. Pushing the knob toggles between coarse and fine value increments. The Intensity button sets the Adjust knob to control the trace's on-screen intensity. When more data is available than can actually be displayed, the Intensity button helps to visualize significant events by applying an algorithm that dims less frequently occurring samples. That wraps up our tour of the front panel. Having said that, there is more than one way to skin a cat on an HDO oscilloscope. Stay tuned for a look at how to control the instrument entirely from the touch screen display.